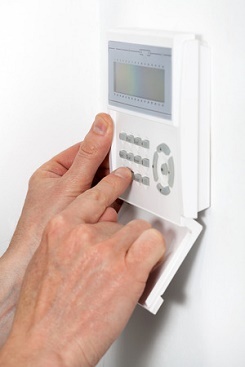 Around 40% of UK households have a burglar alarm installed however around 34% of those people rarely bother to set it. That’s a third of people who could be easily protecting their home from burglary but choose not to. Does this make sense? That’s a simplistic view of course; there could be many reasons why they don’t use their alarm. However, most issues can be resolved fairly easily so we want to encourage everyone who has an alarm to get into the habit of using it again by demonstrating why it’s so important. We’re calling it Campaign #AlarmSetGo. Reason #1: You could argue that just having an alarm with a visible bell box is enough deterrent for a burglar and sometimes this will be true but is it worth the risk? Some burglars will look for clues to assess whether the alarm has been set: they could monitor you as you leave and enter the house and listen out for the beeps; they could attempt to view the alarm panel through any windows you may have in your front door; they could even attempt to force the front door and take their chances, knowing that they would have at least 60 seconds to get away if the alarm has been set. Reason #2: If the presence of an alarm isn’t enough of a deterrent and they break in anyway, many will not proceed if they set it off. Even the most audacious burglar who carries on regardless will almost certainly not want to linger, thus significantly reducing the time they will dare to stay. They may get away with a few items but it will be much less than that of an intruder who can take as much time as he wants. Reason #3: Insurance is also a consideration. If you have informed your home insurance provider that you have an alarm it could potentially invalidate your policy if you don’t set it and are subsequently burgled. Alarms store an awful lot of data and will show exactly when the system was set (or not) so there’s no pretending after the event. Reason #4: Some will happily set their alarm when they go out but don’t think it necessary to set it when in bed at night. Most burglaries take place at night and many will break in despite knowing that someone is home. An alarm would not only alert you to their presence, it would most likely scare them off as well. Just as you wouldn’t walk to the supermarket to do a big shop if you had a car and you wouldn’t write a report out by hand if you had a computer so you know it makes sense to use the resources you have available to you. If you’re convinced we make a good case for using your alarm properly then now is a good time to start; burglaries increase considerably from the clocks going back in October right through to Christmas so if there was ever a time you need an alarm, it is now. In our next blog we look at the reasons why people don’t use their burglar alarms and the solutions to those issues.